About a week ago an amazing post appeared on Stanford University’s website. The post documented a sustained campaign against the author, including detailed accusations of “bullying”, “harassment” and “personal and professional attacks”. The post was a fascinating illustration of the vicious side of academia, which undoubtedly exists but which is seldom so explicit or so public. The author of the post was Jo Boaler, professor of mathematics education at Stanford University. Boaler is well known in education circles. She has conducted a number of studies on teaching school mathematics and has written popular books on the subject. Many in the Australian education community value Boaler and her work very highly. There are some puzzling aspects to Boaler’s post and there is much to untangle in this fight. However, we have neither the time nor the lawyers to attempt to sort it all out. An informative and substantially even-handed report was published on Inside Higher Ed. Suffice to say, the fight centres on a study Boaler conducted from 1999 to 2004. Milgram and Bishop strongly disputed Boaler’s findings and methods, including Milgram making a formal charge of professional misconduct against Boaler. Stanford University considered that charge but found no evidence of scientific misconduct and did not pursue the charge. Subsequently, Milgram posted a detailed critique of Boaler’s study, written by Milgram, Bishop and statistician Paul Clopton. This study has regularly been employed to disparage both Boaler and her research findings. 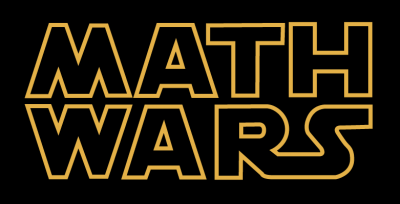 This vicious fight is personal and specific but in ways is just one more skirmish in the ferocious “math wars”, which have been raging for decades. America in particular has been the bloody battleground of “traditionalists” and “reformers”. The traditionalists, as one might expect, are strong on formal methods, times tables and the like. The reformers are more varied, but there is commonly an emphasis on real world problems, discovery-based learning and calculator use. Though alliances are not always predictable or stable, the traditionalists are typically represented by research mathematicians and the reformers by maths education researchers. And through it all, the teachers and students have played the role of innocent (if often partisan) villagers, in whose villages the battles have been fought. It’s been great fun for the whole family. Boaler’s study was clearly intended to be, and is, a powerful weapon for the reformers. Boaler and her colleagues tracked the progress of 700 students in three schools. In two of the schools the students were taught in a traditional manner in streamed classes, and in the third school, pseudonymously referred to as Railside, students were taught in heterogeneous classes with reform techniques. Boaler's conclusion was that the "Railside students learned more, enjoyed mathematics more and progressed to higher mathematics levels". In keeping with privacy concerns, the three schools were meant to remain anonymous. However Bishop, Clopton and Milgram were apparently able to identify the schools. Then, using the available data, they attempted to review Boaler's study. They concluded that Boaler's findings were "grossly exaggerated". The critique by Bishop, Clopton and Milgram (BCM) is too detailed to summarise here, but it contains three major claims; first, that the Railside students did not consistently outperform the other schools' students; second, that the Railside students in Boaler's study were a relatively stronger sample of their classes; and third, the tests Boaler used to measure the students' progress were fundamentally flawed, in that they were testing material on average three years below the students' grade level. And Boaler's response to these strong criticisms? She flatly denies that different student populations were studied in the different schools. Beyond that Boaler's response has been that no response is required: she dismisses Bishop's, Clotpon's and Milgram's "paper" (Boaler's quotation marks) by remarking that BCM has "never been substantiated" or peer reviewed. Belatedly, Boaler appears to recognise that a substantive response to BCM may be appropriate. Though the report in Inside Higher Ed was broadly sympathetic to Boaler, many of the comments to the article have been more sceptical. (That is in sharp contrast to the discussion that occurred on the Australian Association of Mathematics Teachers email list; there, almost every comment has been strongly supportive of Boaler, and without a single suggestion that the criticisms of her research might have merit.) In response, Boaler posted a comment that she intends to provide a detailed response to BCM on her website. At the time of our writing, Boaler's response has not appeared. The Boaler-BCM battle is a great spectator sport, but is there anything to be learned for Australian education? We believe so. To begin, there is an important lesson to be learned on the evidentiary weight of educational studies. A fundamental tenet of academic research is that conclusions should be independently verifiable, that one needn't simply rely on the good faith of the researchers. Perhaps privacy concerns make the openness and verifiability of some education research difficult or impossible to achieve. However, that does not affect the principle that unverifiable research should generally be treated with a significant degree of caution. Secondly, the critique BCM introduced us to a very useful expression: pretend algebra. This refers to a problem that is superficially algebraic but which is in fact so simple, or which can so simply be plugged into one's mandatory calculator, that no actual algebraic understanding is required. BCM provide a number of examples from Boaler's tests, of which solving the equation x2 = 4 is typical. We predict that the concept of pretend mathematics will be invaluable in our future excursions into maths education. Finally, there is the general lesson from the math(s) wars on disagreement and civility. In Australia the maths battles have been much less heated, with plenty of tension but seldom out and out war. And that of course is a bad thing. Seriously. The reality is that there are fundamental and possibly irreconcilable differences of opinion on the appropriate goals of maths education and the best methods to achieve those goals. Your maths masters are of the firm belief that these differences should be debated, openly and strongly. Of course that does not mean we wish to encourage or excuse harassment and bullying. However, getting it right is much more important than an overconcern for civility or fragile egos. Why are things relatively calm in Australia? One reason is that Australian reforms, though at times absurd and destructive, have not been nearly as revolutionary as in America. However, we believe the main reason is that, with occasional and notable exceptions, Australian mathematicians have simply waved the white flag. Australian school maths education is almost totally in the hands of the education academics. Of course, your maths masters regard that as a roaring, roaring, really roaring success. We readily give all due credit to the classy capitulation of Australian mathematicians. Perhaps a Milgram or a Bishop is more than the discussion in Australia requires or could tolerate. But at times we definitely think it's worth a shot.